John Lydgate (c.1370-c.1450) was probably born at Lidgate in Suffolk; he became a monk of Bury St. Edmunds aged 15, a priest in 1397, and during a long life was a remarkably prolific writer of English verse. 'The Fall of Princes' is a translation into English, made in about 1438/9, of a French work of c.1409, which was itself a translation of a mid 14th-century work in Latin by an Italian, Giovanni Boccaccio (1313-75). It concerns men who rise to great power, and their subsequent downfall: a warning to readers of the fickle nature of fate. In the myth of Jason and the Golden Fleece, the hero has to yoke two fire-breathing bulls, and sow the teeth of a slain dragon, before he can get the Fleece from a sleepless dragon. 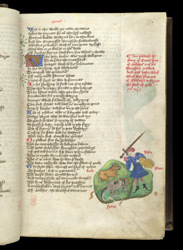 In this image Jason has the Fleece draped over his left arm, wields a sword in his right and beheads a dragon, watched by one of the pacified bulls.